The user of the hp41c could lie to himself “I can have all that if I buy the right modules”, but that would be an enormous money outlay. It must be said that the advantage module provided most of that missing functionality, but it was never as well integrated as it was on the 15c. For example, the complete 4-level complex stack in the 15c; or how well integrated were the matrix functions and the “user” mode to automatically change the pointer for matrix data entry; or the clever use of the permutations and combinations keys for matrix transformations. It really was a clever and elegant device, and still is: more than 25.000 units of the new version have been sold since September 2011. The only two things where the hp41c always got the upper hand was in alpha capabilities and connectivity. (In fact, it can be argued that it has never been bettered in that area, the USB connection of the 50g family being a poor shadow of the many modules and printers that the HP 41c could drive). 30 years later, the HP 41c user got vindicated - finally. With the “CL” module, you have access to all the functions ever created for the HP 41c in the different modules - all at the same time. My preferred current set-up (that is good for my work and my hobbies at the same time) is Advantage pack, Sandmath module (latest version) and HP 41Z module (the Z module has a much better complex support than the advantage pac, in my humble opinion - thanks Angel Martín!). With it, I can say I have let the HP15c behind. But it has taken ages and effort! both competitors face to face. Forgive the picture quality! HP15c clone coming back - but now with a competitive advantage! If you remember, some time ago we reviewed a project for a clone HP15c calculator made in Switzerland. While the project was extremely interesting, it had the worst possible timing: it coincided with the reissue of the HP15c by Hewlett Packard. With good sense, the creators backed off and re-thought the project, in order to give the user something more than the original did. I am carrying the HP15c Limited Edition every day with me, and while its size is smaller than most calculators, it is a tight fit in my shirt's pocket, and it fits well in my jacket's; but sometimes I would like it to be smaller. I look forward to get one. and you? 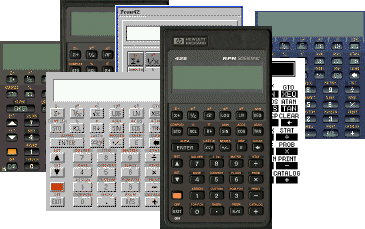 We have a page about RPN: why it is a better way to use a calculator. So far it is embryonic - we need to go much further in the description. We need to have something simple enough to send to one of our friends, and attractive enough so that he gets interested in it. I wanted to include an applet of an RPN calculator, but I have problems in storing files in this server - since is not mine. So far I have not been able to include a proper Java RPN calculator - yet. What I have found is a nice site with emulators in several environments/operating systems - one of them as Java. By the way: it is a very good tool for RPN training. Just make sure to open the window as big as you can: on the right side you will see the stack and the registers, and see the effect of what you're doing on the processor. Of course: no liabilities accepted if the machine is not a perfect replica of HP 15c. I have not tried to program it, and just tried some examples with complex data; but did not do a full review of it. It consists in a calculator of the Voyager series enhanced with hardware and memory that allows it to run the firmware of the different Voyager calculators. You can select, with a special switch on procedure, which one will you use. In the video below, you can see the user selecting between 15c and 16c. Please click on the "cc" symbol on the lower right to get access to text subtitles that illustrate what the user is doing. An interesting feature is that each "environment" keeps its memory even when running a different calculator model. There are some informations about price - around 69 CHF. Having lived in Switzerland myself, I can attest that it is not the cheapest country around by a long shot, and still this is a very good price. How is it working? It may be a port of the "non-pareil" family of emulators, running the original ROM. In this case, while hobbyist intent may get through, producing longer series of a copyrighted software may get the producer in trouble. In the alternative case (all features having been programmed by them in an operational emulation of the original, as opposed to an emulation of the hardware and running the original ROM), then it is a dangerous road, for the original HP15c ROM was one of the highest points of the computer era, when it comes to accuracy of the algorithms, cleverness of the layout, number of features implemented, ROM size, etc. A daunting peak to climb - in your first attempt. Screen. While they could have worked with salvaged HP12c screens (all voyager screens could be used for all models - if you look at your 12c at an angle you will see the GRAD indicator - while the 12c does not have trigonometrics) they have developed a dot-matrix screen. While readability seems to be good, it is by no means the same thing as the original. Keyboard. At this stage, we have just seen renderings and we do not know the materials used and the key feedback. However, we HP-lovers feel that the keyboard is one of the key success factors of the calculators of the golden age - of which 15c is one of the peaks. You cannot know how it will feel until some of us actually test the machine and report. Speed. It always was one of the problems of the voyager family - even when compared with the slow HP41c (clocked at more than twice the speed). This machine claims speeds 60x ; we know that the new HP12c, working on a similar processor, has been able to do 150x - and from the new 12c (called henceforth 12c+) to a 15c+, you just need to port the ROM and a new keyboard engraving. ... I prefer to wait for the real thing. I will probably get it sooner. Enough said. Finally, I include date calculations. The one I use more is the HP12c's DDAYS operation. I then set to find in the web software for it. I did not find it for the 15c, but I did for the 42s, that I then adapted. Attention - it has been modified to cater for European date format: dd.mmyyyy - you will have to go to the part where it decomposes the number into the parts and then change a few lines there. The strategy is just to convert the date format to Julian number, convert the other date, and subtract. Fortunately, the DtoJ subroutine does not consume all 4 stack registers - or we would not be able to subtract them! The NPV and IRR are other favourites. There is another program in the Advanced Functions Handbook, that allows for up to 24 groups of cashflows (assuming you do not have any other program in memory!) and using 68 steps. However, as I said before, in my company we limit Capital Expenditure Proposal analysis to 10 years, so that I set to make a shorter program for 10 cashflows. Register 0 is for the initial investment. Register ,1 contains the number of years to calculate (good to limit the loop and increase speed). Registers 1 to ,0 contain the flows of each year. The system takes X as discount rate (in %). It can be then used to find the IRR through the Solve feature, entering a bracket of guesses in X and Y. Now we come to a weighted average calculator. In many occasions I need to get the average margin of all the brands we sell. But the weighting in HP12c works inverse as I would do. It calculates the average of Y weighted by X, instead of the average of x weighted by Y. As I have mentioned before, most of my duties involve financial calculations in an industrial environment. 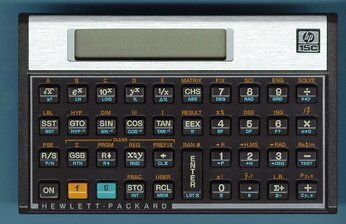 The calculator I prefer among all, because of its simplicity (no menus) and its portability (fits in my jacket and occupies very limited space in a crowded desk, is the HP15. I will continue in the next few blogs with the rest of the memory. For the sake of engineer futility, I have left space enough for a 3x3 + 3 equation system if some time was needed - and it has not been the case so far ! !